Yes there is a written warranty for up to 5 years when the work is carried out by an Approved Applicator. However if you do it your self or use your own painter, Epotec can be expected to perform to the same standard, so long as the Preparation and Application details are followed and pool water is maintained in accord with accepted conditions. Can Epotec be applied by Spray? Epotec may be spray applied (Airless is best), though it’s seldom used even on Olympic sized pools. The ease of roller application and the great finish achieved makes it the most practical way. Can I do it myself or do I need an Applicator/Contractor? Many pool owners save money and do it themselves. The application is quite straight forward using a roller and brush. Doing a good cleaning job is usually the most important. Can you have a non slip surface with Epotec? Do you have local stockists of Epotec? We like to interact directly with all users of Epotec so we have a depot near Newcastle NSW which service all Australia. We send directly to you enough Epotec for your pool. Just complete the Free Quote Form on our web site. How do I keep my Epotec surface clean? Epotec being a seamless, hard wearing coating resists dirt and mould pick up. It may be easily cleaned using a broom or similar from time to time. It will resist staining from leaves etc, though if some staining happens may be removed using a pad and some detergent. Follow normal pool water management for long term Epotec performance and don’t be temped to let pool become a “frog pond” in the off season. How do I order and pay for Epotec? The best way is to complete the Free Quote Form on our web site giving us as much info about your pool (or spa) and well quote you by return. You may pay by Direct Payment or Credit Card, (Visa/Mastercard). How do I recoat my Epotec Pool? After a lengthy period you will see some wear on the high use areas like steps and you may want to recoat the pool. It will generally require a good clean, a light sand and the application of one (or may be 2) coats of Epotec. That’s all. Straight forward and money saving. Much less expensive than upgrading any other surface and you can do it your self if you wish. How easy is it to prepare and re coat my pool? Many pool owners prepare and recoat their pool and have a very successful outcome. We provide plenty of support and written information to guide you though the process. So far no one has said it’s too hard and many have said how pleased they are with the outcome. So if you have the time and can follow clear procedures, handle a roller, then the chances are you will have the same great results. See the Testimonials on our website for what others say. How long does Epotec last? For Domestic Pools there are examples of it lasting past 12 years easily and for Commercial Pools at least 5 years is common place. See the “Project Gallery” on our web site for examples. In general once Epotec is applied to a prepared surface it slowly wears away. It does not chip, flake or peel as a rule, which other paints tend to do. So the thicker the coating the longer it will last all else being equal. We recommend using more material on high wear areas like steps, swim outs and beaches etc, so they last longer. How long does it take to dry between coats and when can I fill the pool? Epotec should be allowed to cure overnight between coats, (up to max 3 days, else a light sand will be needed before the next coat) and when last coat applied, allow to cure 5 – 7 days before refilling. How much does it cost to paint my pool? We will quote you on the supply of enough Epotec for your pool delivered to you door. Simply complete the Free Quote Form on this web site and we’ll be in touch promptly. Epotec is usually applied in 2 coats only, though a 3rd coat maybe applied in high wear areas if needed. (Usually its easier to simply apply more in these high wear areas as you apply the 2 coats). I have acid washed my pool surface, is this enough cleaning? Many people think acid washing is enough to clean the pool surface, however it does not get rid of body fats, suntan oils and the like which will have built up over the years and be well soaked in on porous surfaces, such as Marblesheen. Just like when washing dishes you need detergent to remove fats and so it is with pools. A thorough clean with a detergent/degreaser is part of the correct preparation. Acid washing may be used as last treatment to remove calcium build up and prepare a “new” cement surface for painting. See our “How to Prepare and Paint My Pool” details for the complete preparation. I would like some painted dolphins on the bottom, how do I do this? You after applying the 2 coats of Epotec in the chosen colour use or make your own stencils with dolphins, insignia or favourite figurine and then use Epotec in other colours to make the figure stand out. You can also engage an artist to design and apply the decorations. We supply touch up size packs in different colours for this, so its quite easy to carry out. If I wanted an Applicator to do the work, where do I get one? There are many independent Applicators in many towns and cities. Ask us for details. You may also like to engage your preferred contractor and we can work with them too. Some people have said pool paint lasts only a few years, so how come Epotec lasts so long? Epotec is specially designed for use in pools. There are epoxy paints for use on concrete paths and steel work, which will not last in water immersion 24/7, so you may get only 2 – 3 years life with these non pool type epoxies. Also there is Chlorinated Rubber Pool (Rubber) paint which being single pack, may last 1 – 2 years only. If you want performance and value you need to use the correct Epoxy which is designed for pools, eg Epotec. Epotec comes in a range of attractive colours for use in pools and spas. There are 4 blues, white, black, pale jade, chamois and slate grey. Others are also available and we can make to order if required. See the Colour Chart and Project Gallery on our web site for more details. We can post a colour chart as well. Please note that darker colours will generally create a warmer pool and will also tend to show the residues of salt and pool chemicals on the surface as white stains. While they are all resistant to UV draker colours will tend to lighten over time. What help is available if I wish to do it myself? 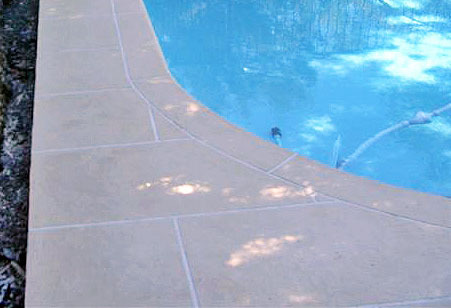 We provide comprehensive information about preparing your pool and applying the Epotec. (see “How to Prepare and Paint my Pool” on the INFO BANK of our web site. In addition we are accessible by email or phone (generally 7 days) for any onsite questions. Epotec is termed a Hi Build, 2 part Epoxy Coating. It’s “Hi Build" meaning it goes on thick (about 5 times thicker than house paint), so you get the protection you need for your pool and it resists wear and tear from sand, feet, automatic pool cleaners and so on. It’s a 2 part, meaning it’s a resin and hardener which are hand mixed together. An “Epoxy” is: “Thermosetting resins capable of forming tight cross-linked polymer structures characterized by toughness, strong adhesion, and low shrinkage” and “ refers to a two-pack paint or glue. The paint or glue is particularly hard or strong as the two-pack system contains a curing or hardening agent so that when the two packs are mixed together there is a chemical reaction between the packs rather than a simple “drying or evaporation". What surface preparation is needed? The surface preparation required depends on the surface and its condition. In general the surface needs to be clean, sound and stable. Full details are in the “How to Prepare and Paint My Pool” which you can see on the INFO BANK link on the navigation bar near top of screen.